Improving adolescents’ sexual and reproductive health and rights, including preventing unintended pregnancy, is essential to their social and economic well-being. Complications of pregnancy and childbirth continue to lead to preventable deaths and ill health among 15–19-year-old women in Uganda. In 2017, the Ugandan government committed to improving access to contraception for adolescents by implementing the National Adolescent Health Policy4 and the National Sexuality Education Framework.5,6 However, increased investment is essential to ensure that adolescents have access to the age-appropriate information and services they need to determine whether and when to become pregnant. Of the 2.5 million women aged 15–19 in Uganda in 2018, 26% (648,000) have a need for contraceptive methods; that is, they are married, or are unmarried and sexually active, and do not want a child for at least two years. Among these 648,000 adolescent women, 39% (253,000) are using modern contraceptives. The most common method among modern contraceptive users is male condoms (50%), followed by injectables (39%). Six in 10 (61%) sexually active adolescent women in Uganda who do not want to become pregnant—395,000 in 2018—have an unmet need for modern contraception. These adolescents either use no contraceptive method or use traditional methods, which typically have low levels of effectiveness. Eighty-eight percent of all adolescent unintended pregnancies in the country occur among this group. Unmet need for modern contraception is higher among married adolescent women than among unmarried, sexually active adolescent women (61% versus 54%). Not all of the 249,000 adolescent women who give birth each year receive the essential components of maternal and newborn care recommended by the World Health Organization and the Ugandan Ministry of Health. For example, about half (49%) have fewer than four antenatal care visits and one-third (34%) do not give birth in a health facility. Increasing use of modern contraceptives by adolescents who want to avoid pregnancy and providing all pregnant adolescent women and their newborns with the recommended levels of maternal and newborn health care would save lives and improve the health of adolescents in Uganda. If all unmet need for modern contraception among adolescents in Uganda were satisfied, unintended pregnancies would drop by 72%, from 214,000 per year to 60,000 per year, resulting in reductions in the annual numbers of unplanned births (from 117,000 to 33,000) and abortions (from 67,000 to 19,000). Likewise, in the scenario in which all unmet need for modern contraception among adolescents in Uganda is met, adolescent maternal deaths would drop by 35% (from 620 per year to 400 per year). If full provision of modern contraception were combined with adequate care for all pregnant adolescents and their newborns, adolescent maternal deaths would drop by 76% (from 620 per year to 150 per year). The 2018 estimated annual cost of providing contraceptive services to the 253,000 women aged 15–19 in Uganda who currently use modern contraceptives is $2 million. This averages $9.32 per user annually. The total cost in 2018 for maternal and newborn health care services for all adolescents who become pregnant and their newborns is $20 million. Meeting the need for modern contraception among all adolescent women in Uganda who are sexually active and want to avoid having a child in the next two years would cost $19 million annually, an increase of $17 million from the current cost. This additional investment would provide improved quality of care for current users and coverage for new users. In the absence of this additional investment in contraceptive services, fully meeting the current need for maternal and newborn care for adolescent women would cost an estimated $118 million annually, of which $59 million would go to care related to unintended pregnancies. Fully meeting adolescents’ need for modern contraception would lower pregnancy-related costs by $43 million, to $75 million. Because the cost of preventing an unintended pregnancy through the use of modern contraceptives is far lower than the cost of providing care for an unintended pregnancy, each additional dollar spent on contraceptive services for adolescents would reduce the cost of maternal and newborn health care for adolescents in Uganda by $2.56. 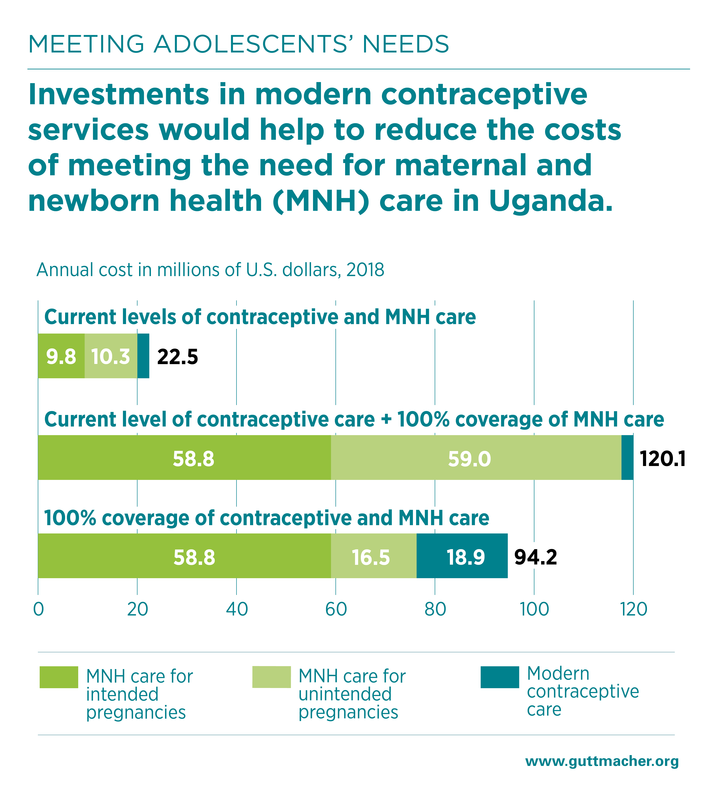 Fully meeting the needs for both modern contraceptive services and maternal and newborn health care for adolescents in Uganda would cost a total of $94 million each year. Annually, it would cost $2.19 per capita to fully meet adolescent women’s needs for both modern contraception and maternal and newborn care in Uganda ($0.44 per capita on modern contraception and $1.75 on maternal and newborn care). The return on these investments goes beyond the critical impacts on health to include broad social and economic benefits for adolescent women and society, such as increases in women’s education and earnings, which can lead to overall reductions in poverty. Ensuring adolescents stay healthy and providing them with economic opportunities and education so they can decide if and when to have children is a critical step toward achieving the benefits of a demographic dividend. Investing in meeting the need for both modern contraception and maternal and newborn health care among adolescents in Uganda is essential to improving health outcomes, and it is more cost-effective than focusing on maternal and newborn health care alone. The most effective actions to improve adolescent sexual and reproductive health take a multifaceted and coordinated approach and provide access to services that are nondiscriminatory; medically accurate; and developmentally, culturally and age-appropriate. The following bullets describe some approaches. Improve access to age-appropriate comprehensive sexuality education and high-quality sexual and reproductive health services for both in-school and out-of-school young people. Invest in public-private partnerships whereby privately run clinics are supported by the government to provide high-quality, youth-friendly sexual and reproductive health services, especially for hard-to-reach communities. Use routine training and mentorship to strengthen community-based health workers’ ability to provide contraceptive information and services. Conduct ongoing review of the Ugandan government’s FP2020 commitments to ensure that family planning investments are realized. 1. Population Division, United Nations Department of Economic and Social Affairs (DESA), World Population Prospects 2017, Female population by region, subregion and country, 1950–2100, 2017, https://esa.un.org/unpd/wpp/. 2. Population Division, DESA, World Population Prospects 2017, Births by five-year age group of mother, region, subregion and country, 1950–2100, 2017, https://esa.un.org/unpd/wpp/. 3. Sully EA et al., Estimating abortion incidence among adolescents and differences in postabortion care by age: a cross-sectional study of postabortion care patients in Uganda, Contraception, 2018, doi:10.1016/j.contraception.2018.07.135. 4. Reproductive Health Division, Ministry of Health, National Adolescent Health Policy for Uganda, Kampala: Republic of Uganda, 2004. 5. Ministry of Education and Sports, National Sexuality Education Framework, Republic of Uganda, 2018. 6. Family Planning 2020, Uganda, 2018, http://www.familyplanning2020.org/entities/80. Unless otherwise indicated, the information in this fact sheet comes from special tabulations of the data underlying Guttmacher Institute, Adding it up: investing in contraception and maternal and newborn health, 2017, Fact Sheet, New York: Guttmacher Institute, 2017, https://www.guttmacher.org/fact-sheet/adding-it-up-contraception-mnh-2017. This fact sheet was written by Taylor Riley with the support of a research team consisting of Suzette Audam, Ann Biddlecom, Jacqueline E. Darroch, Lauren Firestein, Grant Kopplin, Rachel Murro and Elizabeth Sully (all of the Guttmacher Institute). The fact sheet benefited from input from Roselline Achoa of the United Nations Population Fund, and Public Health Ambassadors Uganda (PHAU).